This is yet another dead easy DIY that requires no sewing and can be done in a few minutes flat. The hardest part is finding metal collar tips. I show two different types in the next two blog posts. This week I show how to use collar tips I got from – E-Bay. 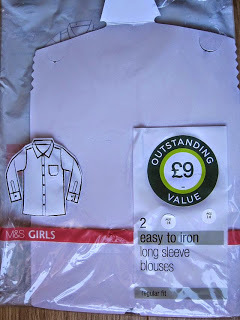 Next week I show the collar tips I got from – ASOS. Good news is that ASOS apparently deliver free to South Africa. I’ve never had had a problem with items shipped out, all been well so far. 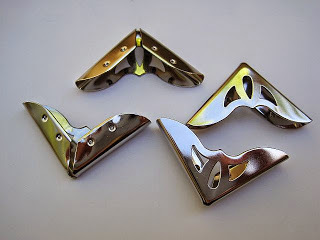 You could make your own collar tips. See – here – or – here. You can also order them from – Etsy. I’m keen to attempt cutting tips for collars from plastic packaging. Remember the earrings I made from food packaging a while back? Read that DIY here. If I spot collar tips in a local haberdashery I will add the details of stockist at the bottom of this blog post. I also plan to show one or two other ways to pimp collars that don’t require collar tips so watch this space. The two collar tips are very different. 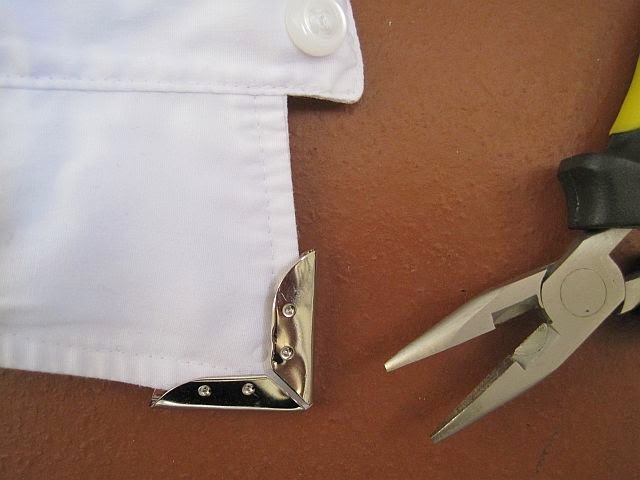 The one from ASOS is heavy and screws on which is handy as it can be re-used on different shirts. I just hope it doesn’t un-screw and fall off. 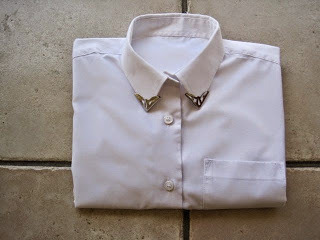 The E-Bay collar tip is lighter and bends back onto your shirt. I pushed the ones used here closed with a pair of pliers. Neither of them was a exact fit to the collars and if you look closely you can see that, but from an average distance they both look fine. shirt never goes out of fashion. Girls shirts are more fitted and button down one way. Boys shirts are slouchy and the buttons close the other way. I fit into a school shirt for a 15 year old girl. 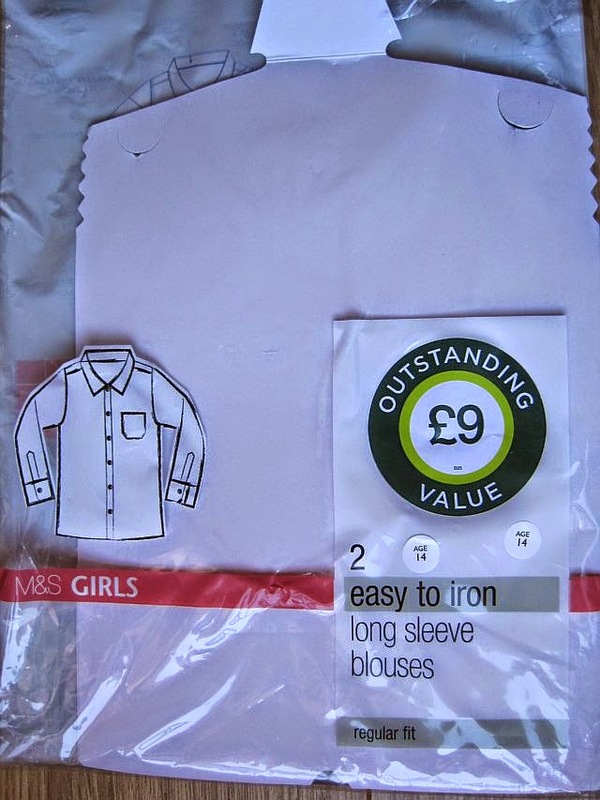 Here – is a link to the Marks and Spencer on-line page for school shirts. A school shirt for a 15 year old girl will fit someone who is 170cm tall, has a 91 cm chest, 71 cm waist and 96 cm hips. You can go bigger or smaller depending on your size and how tight or loose you like your clothes to fit. Go to the Greenie Galleries at the top of this page for more DIY ideas and inspiration to turn old unwanted clothes into new on-trend items. And . . . . you can share your DIY’s or give the Greenie Dresses for Less facebook page a “like”. Till next week . . . .